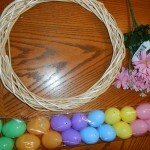 Dollar Store Easter Wreath How-To | Spring Wreath for $3! I decided I wanted an Easter Wreath this year. But I had to make it frugally. 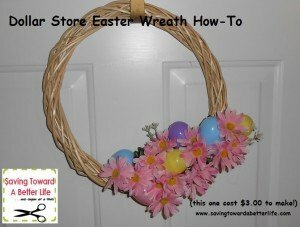 So I headed to the Dollar Tree Everything I used on this wreath came from the Dollar Tree and it cost me $3.00! If you don’t already have a hot glue gun and sticks you can purchase them at Dollar Tree for just $1.00 each. 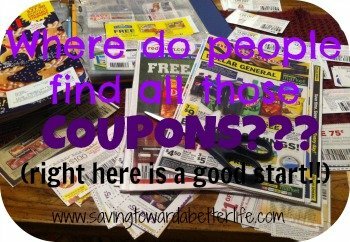 That means even after you purchase the wreath, flowers and eggs you’ve still only spend $5 on the whole project! Pick your flowers (one “bunch” was sufficient but if you pick a different style other than the daisies, you might need more. The larger the flower the less there were on a bunch) and pick your pack of eggs to match the flowers (I went with the pastels over the more brightly colored ones since I picked pink flowers). Cut the flowers apart leaving about 2 inches of stem (be sure to push the leaves up before you cut, you want the leaves to stay on). The wire in the flowers is not thick – I was able to cut through it with a regular pair of scissors. Insert the stems through the grapevine wreath and arrange how you want them. When you have them how you want, all you have to do is flip the wreath over and insert hot glue where the stems and wreath meet to secure in place. Hot glue eggs where you want them. 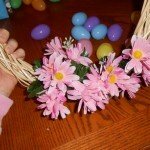 You can also adjust any flowers that are giving you problems (I had some that had petals that wouldn’t stay down) by hot gluing the backs of the petals to the eggs. 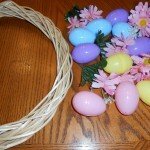 This also helps the eggs look “hidden” which was what I was going for here, a wreath that looks like an Easter egg hunt. Congratulations! You just made a wreath for $3.00!